The best Chicago New Year’s Event for the last 7 years is returning to finish off 2019 with a bang. 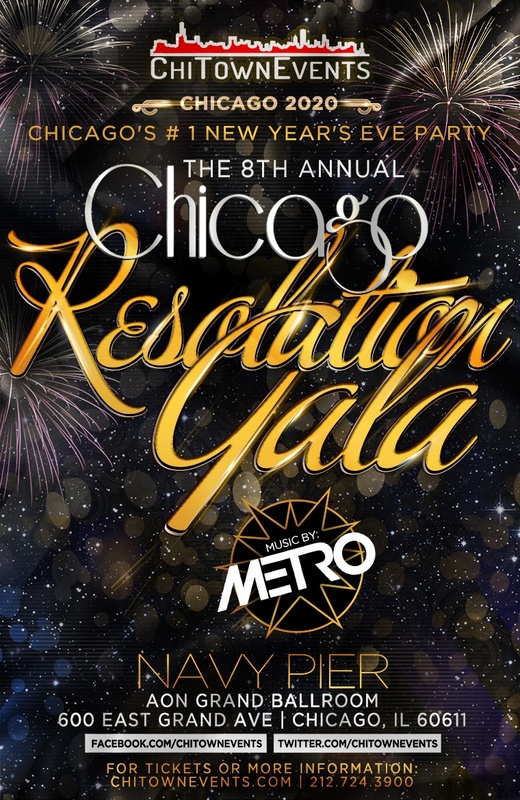 Start the new year at The 8th Annual Resolution Gala at the Aon Grand Ballroom. You’ve been working hard the whole year; treat yourself to an amazing night out, filled with drinks, great music, an awesome atmosphere, and a fireworks show to top it off. Hurry, tickets to this exclusive event move pretty fast, so we recommend securing your spot inside sooner than later. This is our 8th time running this stellar Chicago New Year’s event, so by now, we’re pretty sure we know what we’re doing. We’ll be ending 2019 at The Aon Grand Ballroom, an incredibly spacious architectural marvel that can host over 2000 people. Multiple DJ’s, Buffet Stations, Fireworks and a Champagne Toast. We’d hate for you to end the year on an empty stomach; sink your teeth into delicious appetizers at one of the buffet stations. Treat yourself to a drink at one of the many bar areas located all around the ballroom.Let loose to a mix of the hottest in Hip-Hop, Dance, Pop, RnB, and Top 40 Hits. We’ll have multiple DJ’s turning tables and ringing in 2020 with the perfect tunes. Headlining will be none other than The Chicago Bulls in-house DJ, Metro. Known for his ability to keep the energy of a room at max level with his sense of timing and originality. As 2018 comes to a close, the DJ will stop the noise for a few moments to commence a traditional countdown to the new year. As a confetti shower fills the ballroom, enjoy a complimentary midnight toast to christen 2020. Then, watch the spectacular Navy Pier fireworks show.